In 1851, there were two earlier, separate houses on this site, both leased from Lord Congleton. Occupied by Martin Dowling who was possibly the Martin Dooling, Painter and Glazier, listed in Slater's Directory of 1846. The Dowling family was there until the 1870's when they were succeeded by George Fennell. He was a 'Fancy Goods' dealer who also ran a Newsagency at the Railway Station1. In the 1890's, John Patrick Doris and family lived here. He also had a newsagency which a newspaper item in 1901 recommended to 'those who wish to supply themselves with Christmas reading'. The paper said the exact same thing about the shop run by the Misses Fitzpatrick beside the Post Office in Lower Main Street. A native of Westport, Doris was a journalist with The Nationalist newspaper and a prominent figure in the GAA. He was also active in local politics, especially in a controversy over how the 1798 Centenary should be celebrated in the county. By the time of the 1911 Census, the family had moved to Athlone and the premises became a shop run by Anna M. Dennehy, a native of County Tipperary. It was briefly occupied by an Alice Bowe (1914) before being acquired by the Bannan family next door. Dominic Dunne in the 1850's and, later, Mary and Eleanor White (1870). Acquired by the Bannan family in the 1880's and, in 1901, Tobias (originally from Campclone, Ballyfin) and Maria were living here with their four sons. As well as the modest description on the Census Return (Carpenter & Shopkeeper), Tobias was an undertaker (Coffins supplied at the shortest notice), a sinker of wells, a borer of pumps, a blender and bottler of whiskey. He also found time to erect a Crucifixion in the local cemetery and build the crib which, for many years, adorned the parish church at Christmastime. A remarkable photograph exists of their shop (T. Bannan. Grocer) which, as well as the two proprietorial-looking ladies in the doorway, features a quartet of 'gas men' striking a variety of poses. In the window are advertisements for John Jameson and Bass, and a poster for Hurling Championships at Maryborough. The date on the latter is illegible, but, from the people's clothes, I would guess that the picture is from the 1920's or earlier. Tobias Bannan died in April 1915 and was succeeded by his son George (1890-1944), whose versatility evidently matched his father's: Undertaker, Building Contractor and General merchant. Wood and Metal Pumps supplied. Saw Mills, All sorts of Joinery, Plumbing of all descriptions. His mother Maria died in 1933. Tobias's son Richard and his wife Elizabeth née Cullen had a small orchestra which, before the advent of the 'talkies', provided the music in the local Electric Cinema. They later lived in Grattan Street and their family became noted for their musical ability. From 1924, in premises leased from my grand-aunt, Richard ran 'Bannan’s Hall’, a dancehall in what is today the Reliable House Furnishers building in Station Road2. Throughout the 1940’s, 50's and '60's, his son Toby led a very popular Danceband (Featuring Electric Hawaiian Guitar) and, in the 1950's, his wife Frances ran a School of Dancing, offering Expert Tuition in Classical Ballet, Traditional Irish Dancing, Tap, Acrobatic and Troupe Work. His sister Marie was an accomplished pianist and at, one stage, his brother Fred, a Housing Officer with Westminster City Council, was organist in St Aloysius Church near Euston Station in London. I like to imagine that his music gave some comfort to homesick compatriots newly arrived from Holyhead and living in coldwater flats in nearby Camden Town. 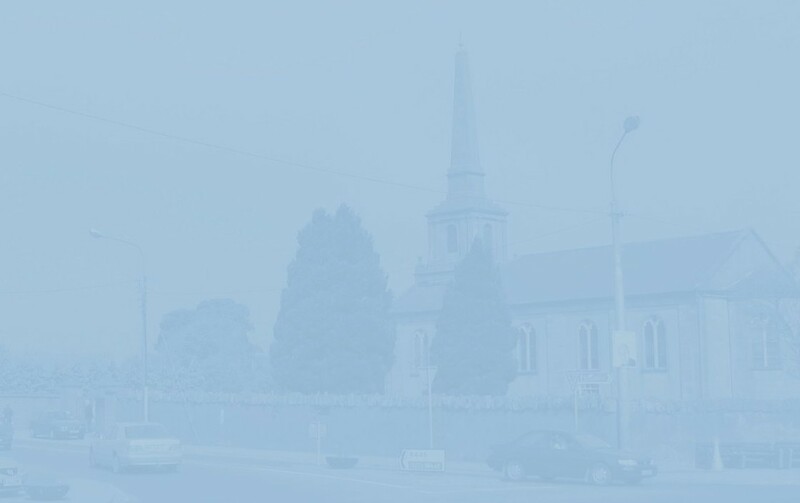 On his eventual return to Portlaoise, Fred also played in the Parish Church. He died in November 2002. In 1950, brothers Peter and Charlie Keegan bought No. 16 and the Bannan family moved into No. 17. Six years later, Charlie bought the pub - formerly Kearney's Crystal Bar - in Lower Main Street that still bears his name today. In the Market Square, Peter also sold agricultural equipment from the rere of his premises (1957 newspaper ad: Buy a cocklifter – the implement with everyday uses on the farm) and, in 1963, after taking took over Bannan's Undertaking, business he bought No. 17. After he combined the two buildings the local newspaper poured lavish praise on the 'citified appearance' of the refurbishment. 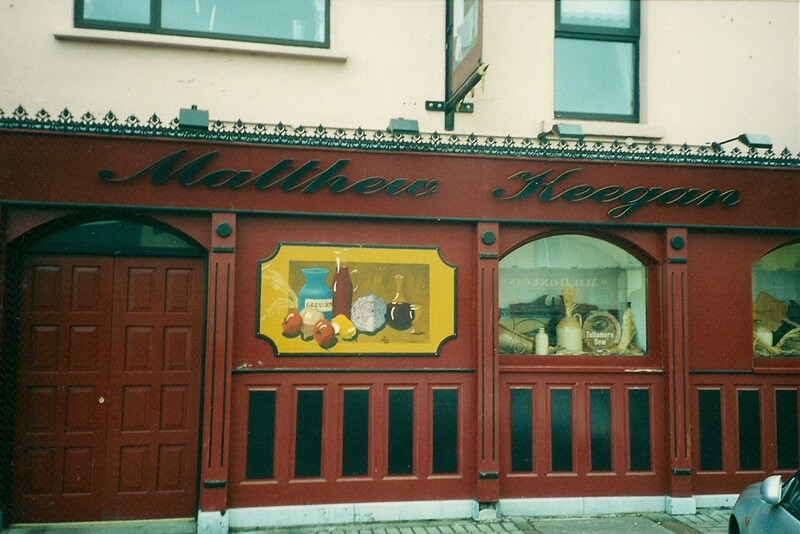 Peter Keegan was eventually succeeded as both Publican and Undertaker by his son Matthew. In 2008, the business became Coppers Late Bar. In August 2015, Coppers relocated to the rear of the premises to be replaced by The Market House facing in to the Square. One person I spoke to recalled how, half a century ago, he was regularly sent to Keegan's 'for a message' . Down along the narrow corridor past the chatter in the pub, to the grocery at the rere, where he placed his order for three slices of ham for his mother and a bottle of stout for his granny. 1 Up to the 1960's, there was a newsagent's kiosk - at one stage, run by Eason's - at the station. It was a favourite haunt of young lads from Station Road and Coote Street who could get their eager hands on The Hotspur or The Victor "hot off the train" and, crucially, before they were delivered to the shops "up the town". 2 In the 1950's, the hall was also the venue of Cully's Bazaar, run by Jim Cully from Tipperary, ex-professional boxer and the Tallest Man in Ireland who, according to local legend, drove his Mercedes from the back seat. (I can vouch for his altitude but not his motoring technique.) The Bazaar's attractions included Pongo (a forerunner of Bingo), £30 in Balloons, a rifle range, and Lulu who "presents bigger and better prizes"! Roll Up! Roll Up!